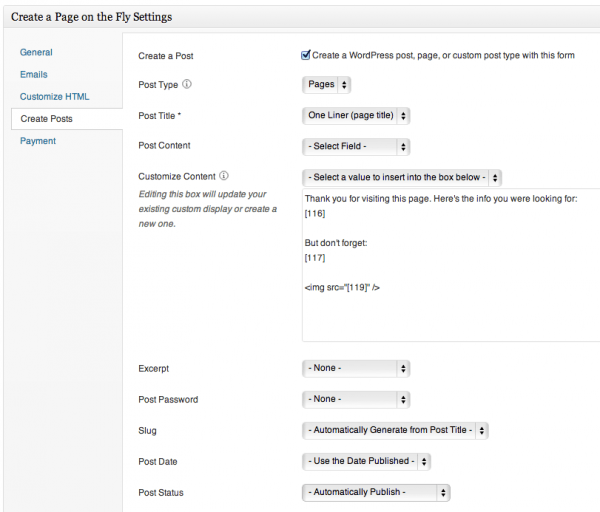 Why create WordPress pages automatically? 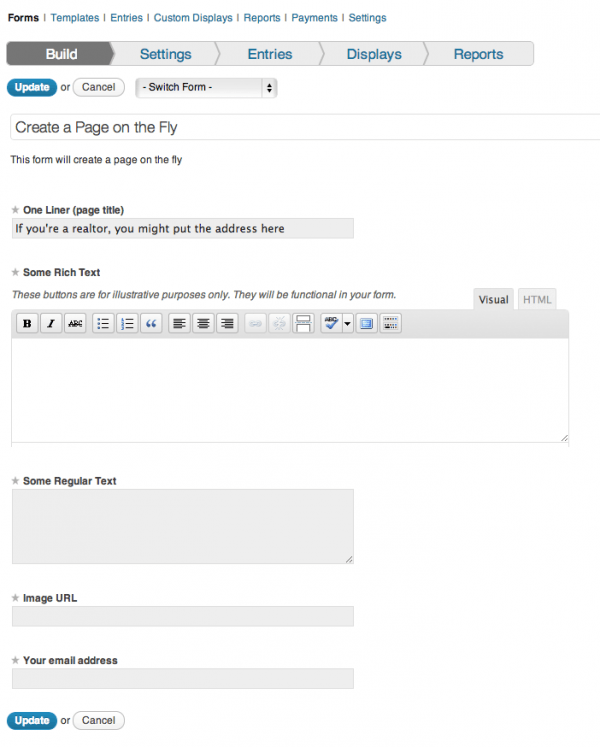 In essence, you want the pages created, you just don’t want the burden of teaching people WordPress. So you give them a form instead. Whatever the reason, the truth is that it’s not that hard. Especially if you’re using FormidablePro. I know, it’s a bit silly, but this tutorial requires it. Why not GravityForms (which I also really love)? 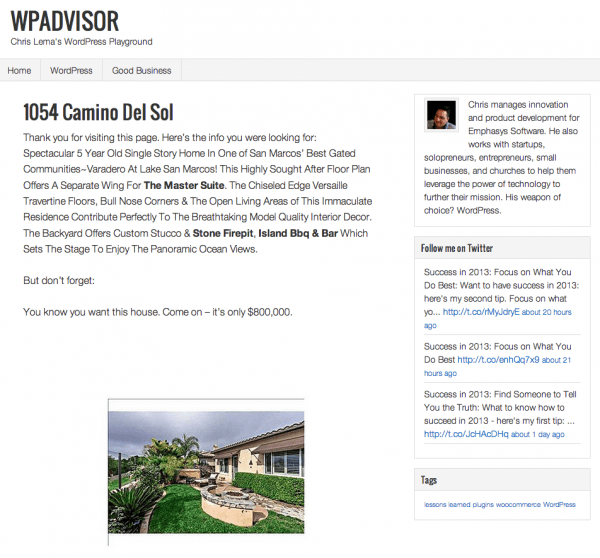 Because FormidablePro creates pages, posts and custom post types automatically. No code. No additional plugins. No work-arounds. All automatic. Just click on the buttons on the right and you’ll see the fields appear on the left. It’s incredibly easy. 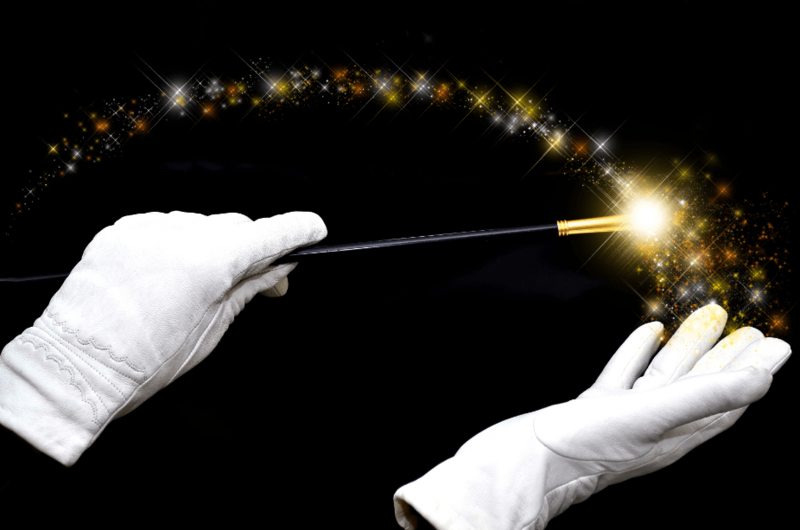 Make sure you create at least one ‘single line’ field, so that can be used for your post title. 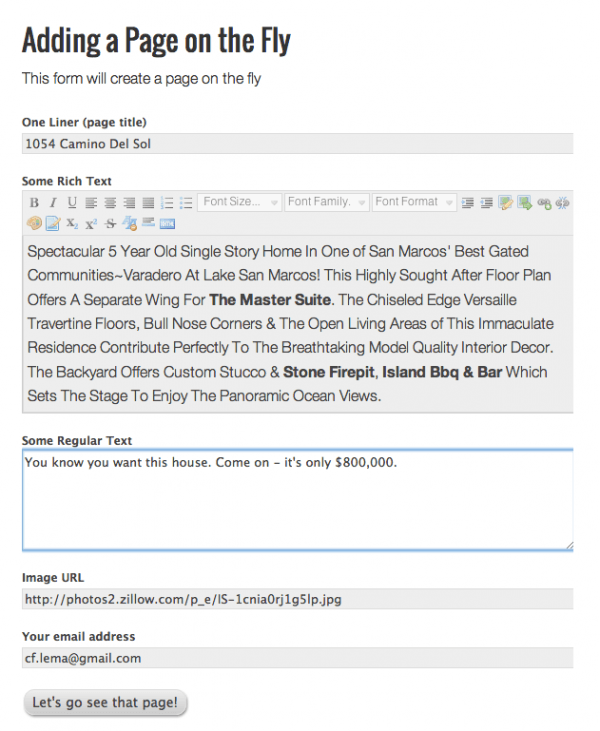 In my case, I’m imagining creating a simple micro property page, so I’m going to collect a street address. Also notice you can put image url fields, and even image uploads (perfect for situations where you want a good image on the new page). But I decided not to fill up my test area with a bunch of uploaded images, so it’s image urls for now. Notice in settings that I don’t start with “General.” I’ll come back to that last. First, for me, is the “Create Posts” option. This let’s me create a page automatically, using the form content. You’ll notice I use the single line entry for my post title. I also let the slug be created automatically from it as well. I also mark the post status to be automatic (I don’t want a bunch of drafts for this demo, but you may for what you’re doing). Lastly, is the content of the new page. I can type anything I want, including the use of all the fields I just collected. Notice the drop down above the space for the customized content. It has all my fields ready (so I don’t have to go looking up field IDs). I can also put the uploaded or url image references inside normal tags (like the image tag) to display the content. I then jump over to the email settings and instead of just getting an email to me ([admin email]), I also put the submitter’s email (given to me on the form). 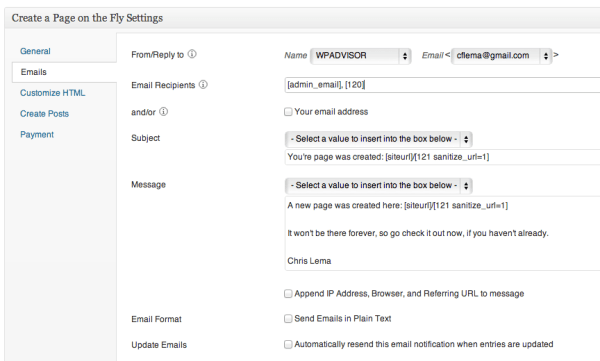 I configure the body of the email and hit save. This means a page will be created and then an email will be sent out announcing it. Since I asked the form to auto-create the page based on that field, I should be able to route to it, as long as I sanitize the url. 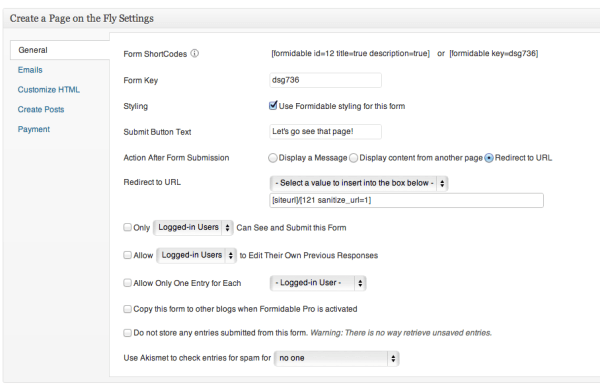 Here is the form (placed by dropping the short code on the WordPress page). And here is the automatically-created WordPress page.